Thảo luận trong 'ENGLISH' bắt đầu bởi Nino Leitner, 13/4/19 lúc 04:25. 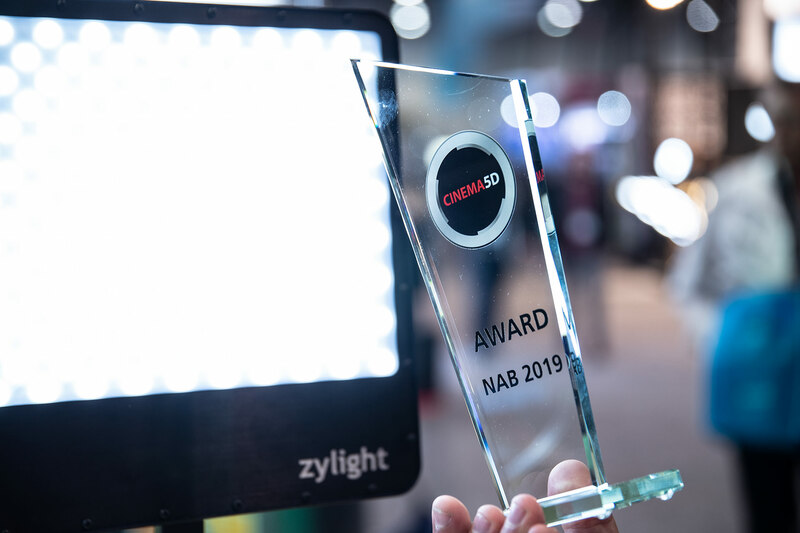 NAB 2019 is over and the cinema5D team has decided on this year’s cinema5D NAB 2019 Best-of-Show Awards. There’s a few familiar brands, but many new names as well. 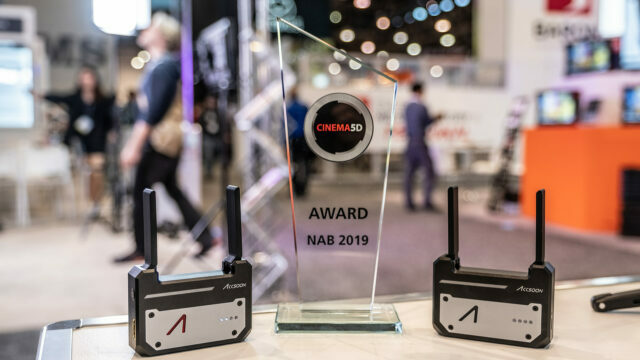 NAB is undoubtedly the most important annual gear show for film technology nerds, which is why cinema5D dedicates a lot of resources in covering this show for our readers, both in written posts and in show news videos. In total, we had 9 team members working on the show coverage, with 6 person on site in Las Vegas, and 3 working on writing and administration from home. 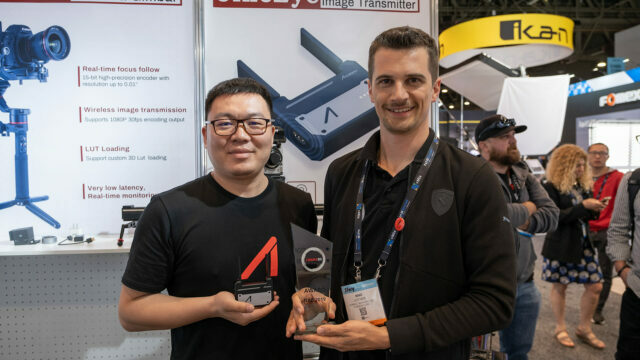 As an overall trend it’s clear that Chinese and other Asian manufacturers are creeping into the mainstream, also in terms of innovation, while we have seen a number of medium-sized American brands disappear from the show floor, possibly because of the strong competition from Asia. It’s a sad trend but it was to be expected. 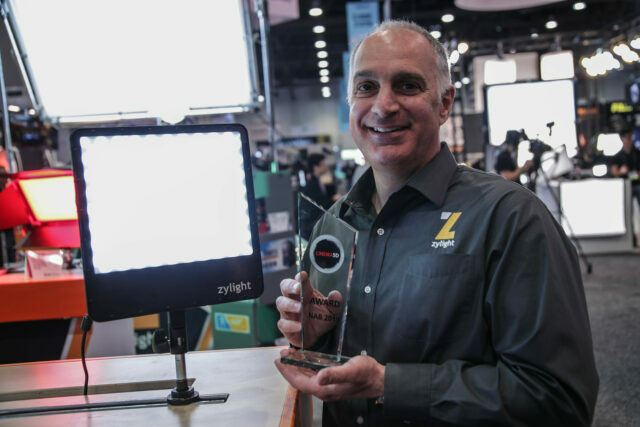 There’s still a ton of new lighting gear coming out all the time, and especially RGB lights are becoming the new mainstream. There were no big camera announcements at the show … only the Sharp 8K camera which we tested on the first days of the show. 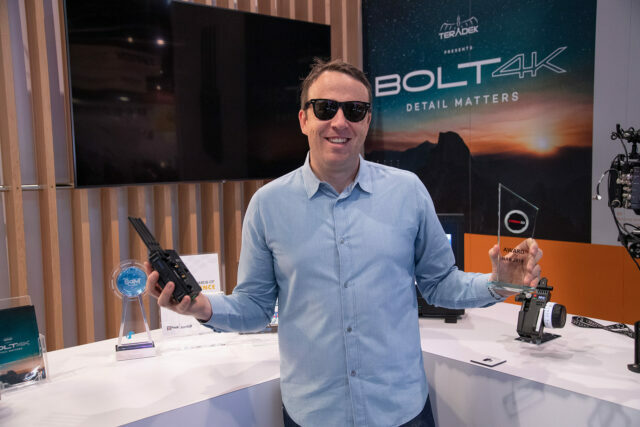 Ian Kerr CSC from Canada arguably had the coolest “product”, actually just a prototype, at the show: a modern approach at the Bolex or ARRI ST 16mm camera. A rotating barrel of EF-lenses in front of your E-Mount camera (in this case an FS7), and it works like a treat. 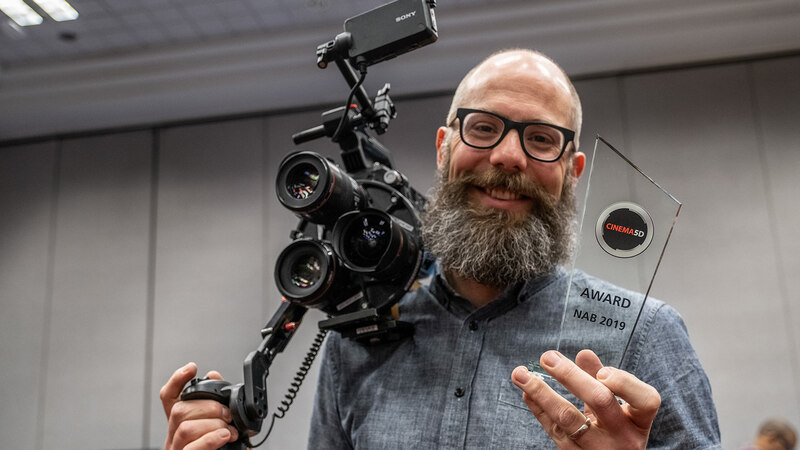 Perfect for documentarians working from the shoulder without an assistant, plus it looks quite intriguing. We can’t wait until he finds a manufacturing partner and until this hits the market! Watch the video and read the full post here. 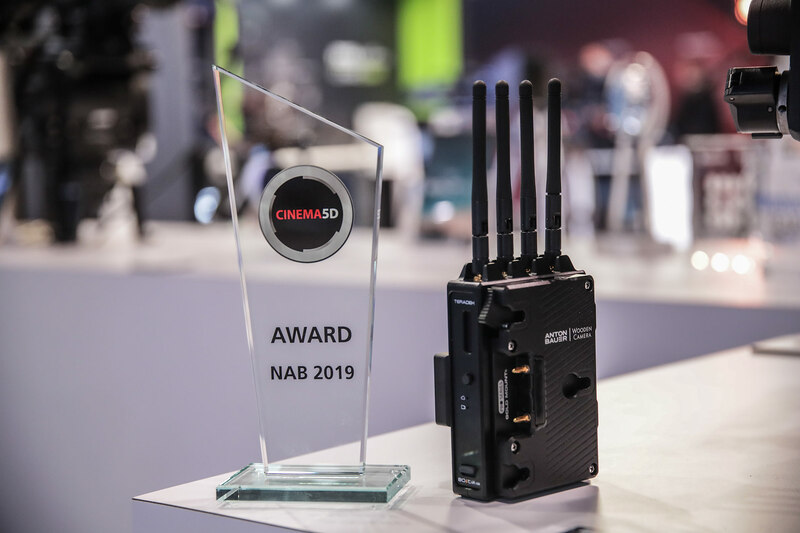 Quite a technical achievement, Teradek released a 4K wireless transmitter from their famous Bolt series, in 10-bit 4:2:2. It isn’t cheap, but certainly future-proof! Congratulations on this technology. Watch the video and read the post here. A panel with a variable diffusion setting is something we hadn’t seen before, quite impressive technology. We hope this finds its way into bigger panels as well. It was impressive to see (yet it was hard to show on video) how the variable diffusion setting affected the structure of the light. Watch the video and read the post here. 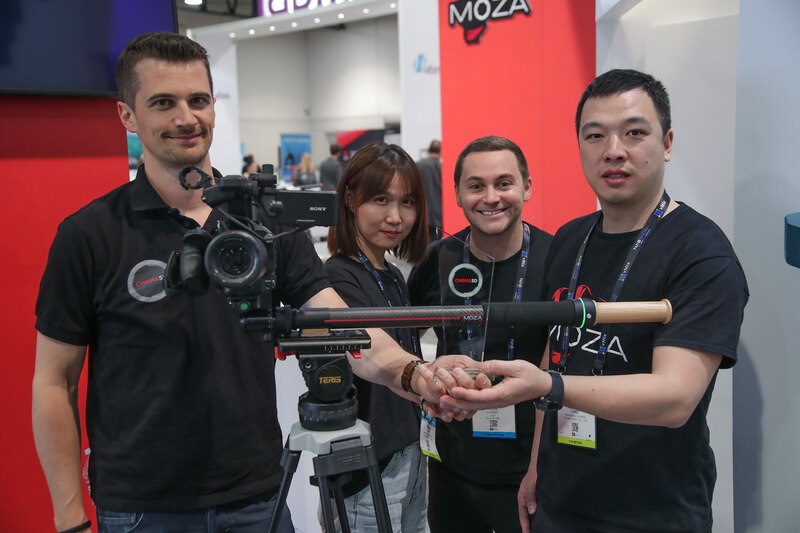 Another thing that we haven’t seen before – Gudsen MOZA married the Monopod with a camera slider, and the result is the Slypod. Interesting because it doubles as a vertical and horizontal slider for cameras, is easily packable, and can of course also be used as a monopod. They claim you can use it instead of a drone when you aren’t able to fly somewhere, though I am not sure if that makes sense considering how slow the pole moves. Nevertheless, a nice idea and good technical achievement that we can’t wait to test in the field. Watch the video and read the post here. This tiny, well-built device allows you to stream video from your camera to your phone or tablet (both Android and iOS), to up to 4 devices simultaneously. Their app is really well made too, and features pro monitor features like waveforms, peaking and zebras, with only 2fps of delay. Totally acceptable for client monitors, and small enough to “live” on your camera whenever there are clients in the room that you don’t want to have prying over your shoulder on a shoot. And the best is the price – the CineEye will cost only around $220, which makes it a total no-brainer compared to the competition. Read the post and watch the video here! 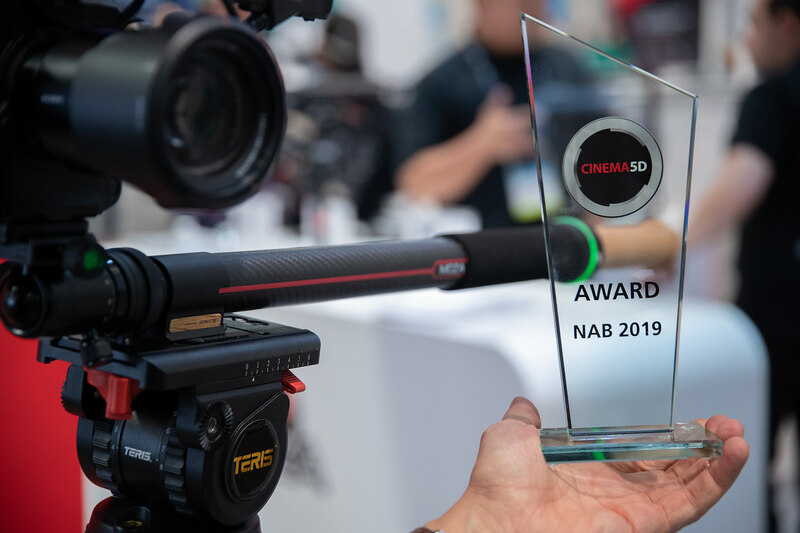 Congratulations to all of this year’s cinema5D NAB 2019 Best-of-Show Award winners! Which one of these products impressed you personally most? Let us know in the comments below. Oh, and just to be clear – we have LOTS of additional videos and posts from NAB coming over the next weeks. We just didn’t want you to bombard you with all at once! The post cinema5D NAB 2019 Best-of-Show Awards – Multi Turret, Bolt 4K, Zylight, Slypod, CineEye appeared first on cinema5D.